Dr. Cassandra Shores was born and raised in Columbia County and knew from a very young age that she wanted to pursue a career in veterinary medicine. She dedicated herself to acquiring experience with a variety of animal species. In addition to horseback riding, she participated in many activities including Girl Scouts, dance, volleyball, softball, downhill skiing, and theater. Dr. Shores attended the University of New Hampshire, graduating in 2004 with a Bachelor of Science. 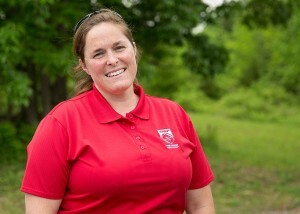 Following her time at UNH, Dr. Shores attended Ross University School of Veterinary medicine and completed her clinical work at Cornell University of Veterinary Medicine obtaining her D.V.M. in 2008. She continued on a Cornell for six months, splitting her time between research on EHV-1 and as an assistant laboratory instructor, before moving to Illinois for her yearlong internship at Kendall Road Equine Hospital in Elgin, IL. During her internship, Dr. Shores developed an interest in anesthesia, ophthalmology, and emergency medicine, although she enjoys all aspects of equine veterinary practice. Upon completion of her internship, she pursued her passion by joining a mixed animal practice as their equine emergency associate. Dr. Shores is very excited to be joining the team at Rhinebeck Equine and brings years of experience in ambulatory and emergency medicine to the team. She and her husband Rob, along with their three young children, are looking forward to being close to family as well as getting reacquainted with the Hudson Valley region. Dr. Shores is a member of the AVMA and AAEP. In her spare time, she enjoys pleasure riding on her mare, downhill skiing, fishing, scuba diving, gardening and spending time with family.